Small incisions made by wands in laparoscopic surgery were touted as a “breakthrough” for cervical cancer. To understand how minimally invasive surgery for cervical cancer became popular before high-quality evidence was available about its outcomes, consider some rah-rah local news coverage. Back in 1995, for example, The Record of Hackensack, N.J., reported that laparoscopy “made surgery simpler and less painful,” with a doctor calling its tiny incisions a “breakthrough” for cervical cancer compared with open surgery involving a large cut. And a 2011 story in Carlisle, Pa.’s The Sentinel gave a woman’s glowing account of robot-assisted hysterectomy, which she said led to “so little pain” that she had to keep reminding herself she just had surgery. Those were among at least 20 one-sided newspaper stories that turned up in a ProQuest database search. Such channeling of provider hype partly explains why many were stunned by a randomized trial published last week that found minimally invasive surgery actually results in more deaths of cervical cancer patients compared with traditional surgery. Ahead of robust data, doctors and the hospitals that woo them had rushed to adopt laparoscopy and robots, which came to be used for about half of radical hysterectomies for early-stage cervical cancers in the U.S.
We often sound an alert about newer-is-better marketing messages that are promoted to the public with the help of uncritical news reporting. It’s a good time to renew our call to be cautiously skeptical when you hear gung-ho messages about minimally invasive procedures. It’s important to ask: What is the evidence for the safety and effectiveness of a given procedure? 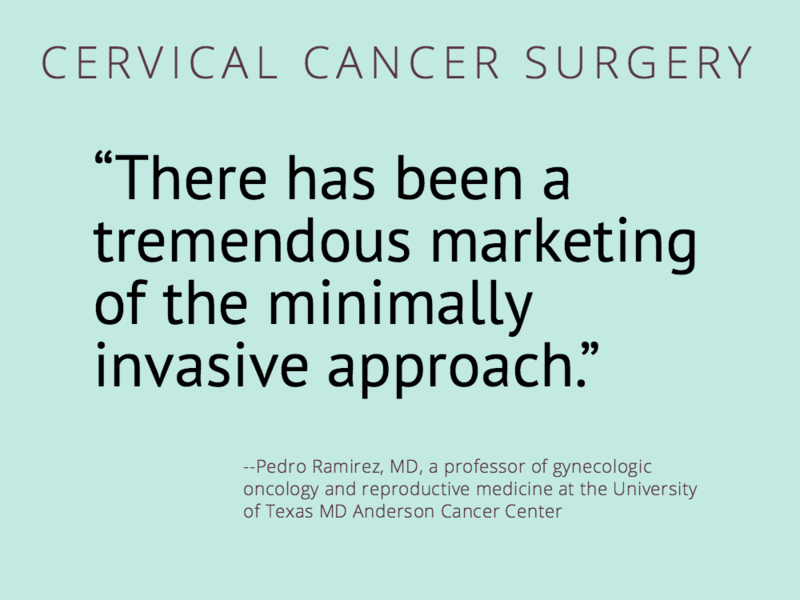 That message is shared by the lead researcher in the randomized trial that compared surgical techniques for cervical cancer, Pedro Ramirez, MD, a professor of gynecologic oncology and reproductive medicine at Houston’s University of Texas MD Anderson Cancer Center. 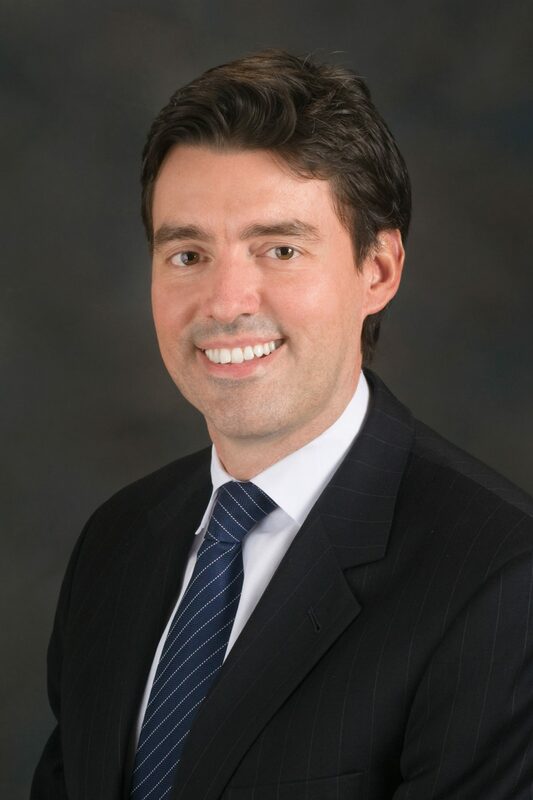 “There has been a tremendous marketing of the minimally invasive approach, including physicians marketing the uniqueness of their practice, saying ‘I’m the only one who does this approach.’ When you set a level of uniqueness about what you do, then automatically patients will think it’s better,” Ramirez said. The trial — covered last week by NBC, The News York Times, The Associated Press, and others — showed three-year overall survival was 91.2% for patients who had surgery using laparoscopy or robotic technology, versus 97.1% who had traditional open surgery. That finding was bolstered by an observational study that linked minimally invasive surgeries to shorter survival. Researchers said more study is needed to explain why cancer recurred more often in the minimally invasive group. Some theorize that those techniques might miss some cancerous tissue or inadvertently spread cancer cells. Among those surprised by the outcome were researchers themselves, who pointed to the need for more controlled trials in surgery. Doctors based their beliefs on retrospective observational studies that linked less invasive procedures with less blood loss, shorter hospital stays, and fewer complications. For data on the limitations of such data, see our toolkit on observational studies. Such potential benefits have figured prominently in marketing, along with the promise of faster recovery and less scarring. Also problematic was that until now, there was only weak observational data to show whether less invasive techniques are as effective as open surgery in removing cancer. As we’ve written, medical devices are often allowed to be marketed with little evidence for safety and effectiveness. Minimally invasive surgeries jumped dramatically after 2005, when the da Vinci robot was cleared by the FDA for use in gynecologic surgery. DaVinci’s manufacturer, Intuitive Surgical, funded training to enable gynecologic oncologists to use its device. In 2010 alone more than 1,200 surgeons were taught to use it, according to one report. By 2014, about 1,500 U.S. hospitals had invested in a da Vinci at $ 1.5 million to $ 2 million apiece. 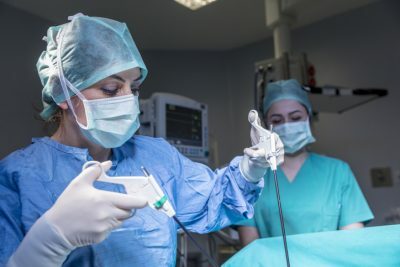 All the while, purported advantages of minimally invasive surgery were heralded in marketing materials, news releases, and some news coverage. They also factored into some patients’ medical decisions. A woman interviewed last week by NBC said she “chose minimally invasive thinking it was the best, latest and greatest and best thing to do.” Her cervical cancer recurred following surgery, the network reported. This isn’t the first time that robotic surgery hasn’t matched its hype. We’ve written about women who incurred a life-threatening complication called vaginal cuff dehiscence, a separation of a vaginal incision, which has been shown to be more frequent after robotic hysterectomies. To their credit, two news stories that turned up in the database query also discussed the evidence void for minimally invasive procedures. A 2010 Rochester (N.Y.) Democrat and Chronicle story noted a “scarcity of peer-reviewed studies on whether the surgical outcomes are better” with robotic surgery compared with other types of surgery. “What’s driving robotic surgery is the perception it allows better operations. But we don’t know if that perception is true or not. We don’t have the empirical evidence,” Kim told the paper. More evidence appears to be on the way. Ramirez said his team expects to publish long-term quality-of-life findings for cervical cancer patients that may challenge assumptions about the advantages of minimally invasive procedures. He said the trial — which cost an estimated $ 1 million — was funded primarily with philanthropic gifts “from people who felt that surgical research needed to be supported.” Medtronic, which makes laparoscopic devices, covered $ 125,000 of the cost as part of its overall support of surgical research at MD Anderson, he said. Medtronic did not have a role in designing the study, according to the published research. Ramirez declared no competing interests regarding the trial. He received about $ 36,000 in industry payments from 2015 through 2017, mostly consulting fees from device makers, according to the Open Payments web site. Other randomized trials have shown comparable survival between minimally invasive and open surgery when it comes to early-stage uterine, colorectal, and gastric cancer. Ramirez said this trial’s negative result should encourage trials of other surgical procedures. “This should be a wake-up call to say we should put more resources into these trials, not just take the retrospective data and say, ‘Go with this,’” he said. 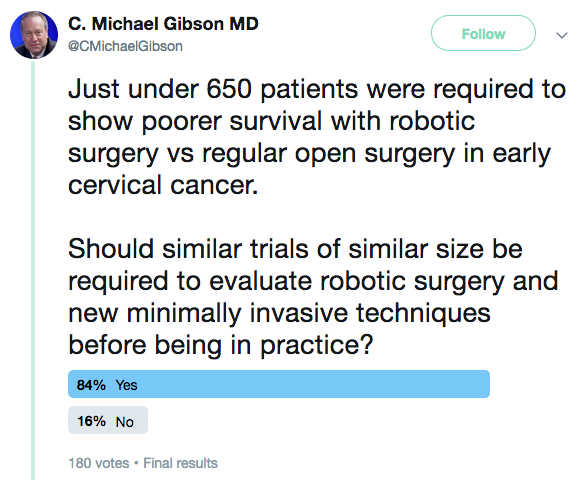 Many agree, judging by the overwhelming positive response to this Twitter poll by interventional cardiologist C. Michael Gibson, M.S., M.D.